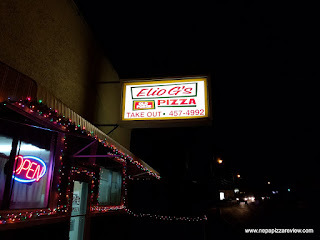 Elio G's is a little pizzeria in Old Forge that I've gotten several email recommendations to try out in the last year. I have tried it before at a party here or there, but never got the chance to actually have it fresh and do a formal review so I was excited to have the chance to finally get there and give it a try. Elio G's is just off the "Pizza Strip" (Main Ave) in Old Forge, and it's an unassuming little pizza shop so it may not get as much publicity as some of the OF heavyweights, but it's a small shop that does takeout only and tells you when you can pick up your pizza. I ordered a half tray of Old Forge Red around 5:15, and my pickup was scheduled for 6:30. This is a neat way of ordering that I've encountered at a few old school pizzerias before, such as Shandra's in Pittston. Sensing this old school mentality, I figured I'd ask if they took credit/debit cards, and I'm glad I did because it is cash only. When I arrived, I was greeted by a very friendly woman at the counter that told me the pizza would be ready in a few minutes and offered me a glass of wine while I was waiting. In all my years of pizza reviewing, I had never been offered a glass of wine! I accepted, and after I verified my pizza was already in the oven, I let her know that I was from NEPA Pizza Review, and we had a fun conversation with a couple loyal customers as well as the pizza maker who requested a shout-out for "Joey Pepperoni." I hung out for a little bit, and I have to say I had a blast with the conversation and just watching the process of making this unique pizza and how they knew everyone's name that came through the door. It was very much a family atmosphere, and you really don't see this type of interaction with customers as much anymore. It's always refreshing when I meet pizzeria owners that foster this type of relationship with their customers. 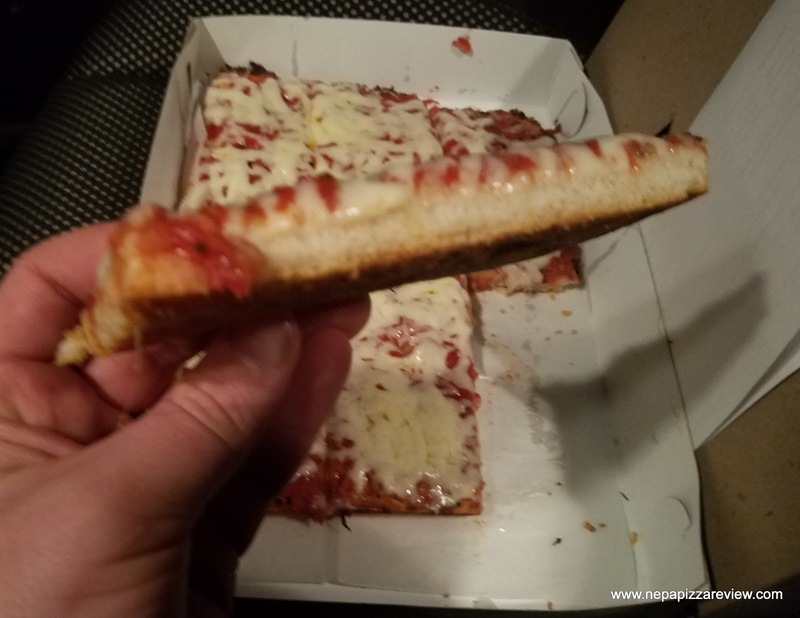 I was almost disappointed when the pizza was done because I wasn't ready to leave yet, but I was hungry so I paid, thanked everyone for a wonderful experience, and headed back to the pizza mobile. As I walked the pizza to my car, I could smell the pungent aroma of onions bellowing from the box. 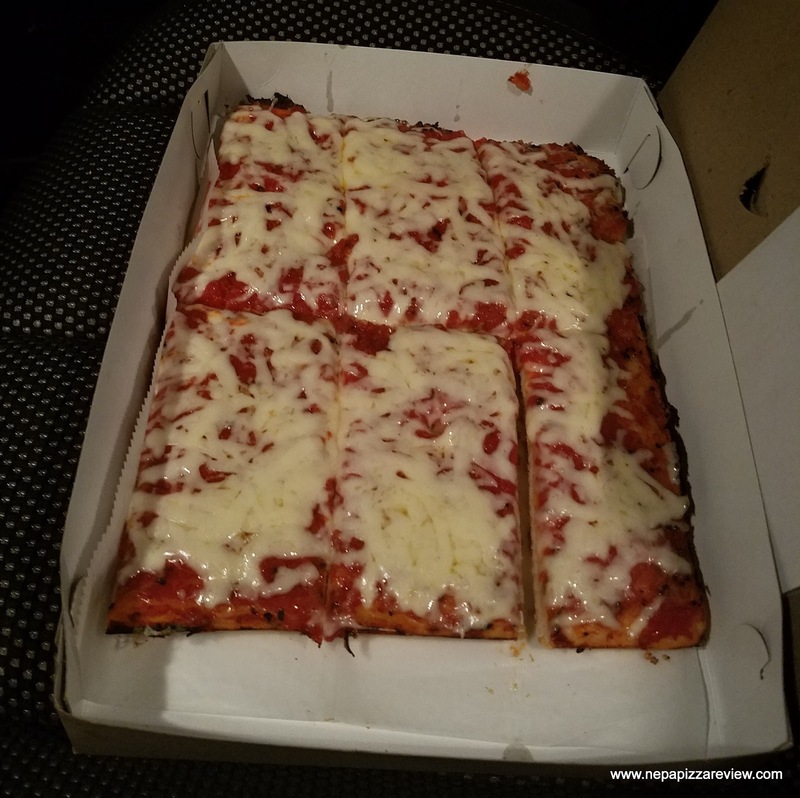 I opened it up to have a look and it looked very nice, and very different from the other local old forge pizzas that I've seen. It was covered with a white cheese that certainly was not American cheese, and it wasn't smothered, rather sprinkled moderately on top. The cheese was sufficiently melted, but certainly not molten lava, and definitely not burned like many old forge trays. I observed why this was the case, because the cheese is not placed on top until late in the cooking process. The sauce was among the most flavor-packed that I've had. There was a significant onion flavor and a little bit of spice, with a certain zest that worked nicely for me. I will say that I brushed my teeth 3 times and hit some mouthwash and my wife still didn't want to kiss me about 6 hours later because of the onion smell! 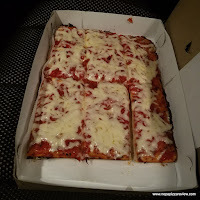 Some people don't like onions in their sauce, but for this type of pizza, I do and I enjoyed them even though I had to give up a smooch or two along the way! The crust was a pleasure to eat because it was fresh, light, crisp, and flavorful. 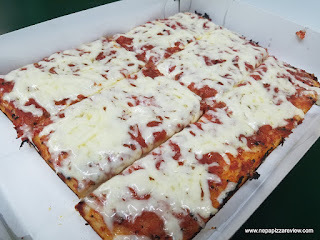 Racks of freshly pressed dough raising were spread throughout the kitchen so I knew that I wasn't getting some precooked shell, I was getting freshly baked goodness and I love the fact that I got to watch quite a few crusts get made for other customers right in front of me. 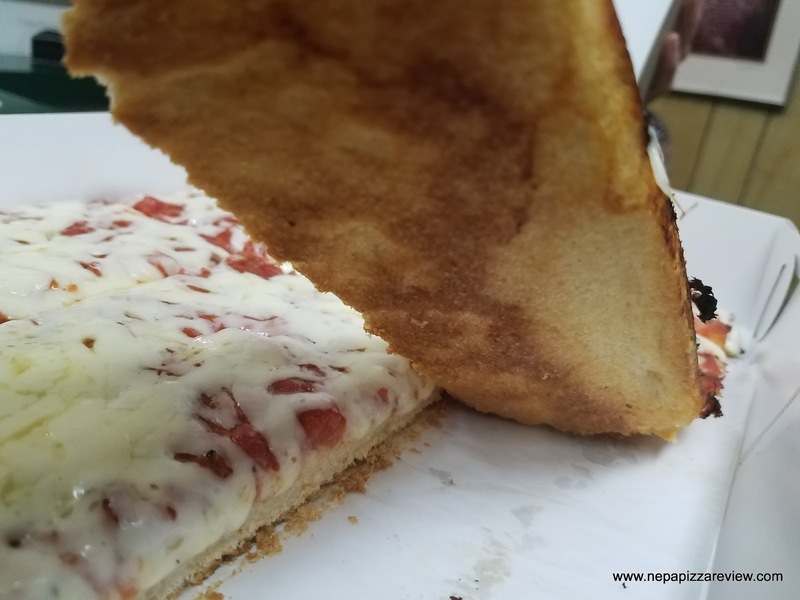 I think the crust was my favorite part as it combined well with the light crust and the sprinkling of cheese held the pizza together both physically and flavorfully. 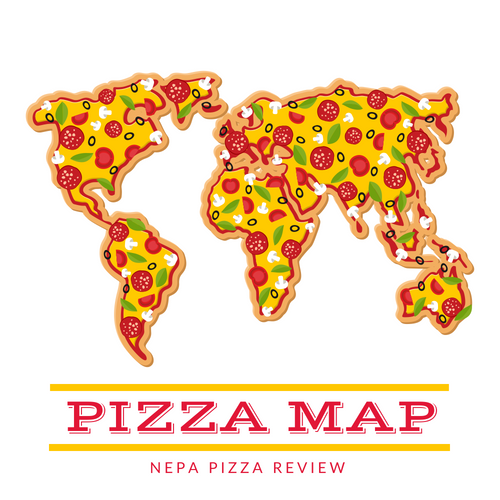 Overall, I definitely enjoyed the pizza and it's among my favorite Old Forge pizzas, primarily because of the zesty sauce and use of a cheese other than American. Moreover, I totally enjoyed my short time spent with the staff at Elio G's, and I think the Food Network or someone that does food reality shows needs to get here and check it out, because it'd be must see TV! Also because this is such a classic small business story that more people should know about.